Born Joan Campanella's first encounter with ISKCON was in September of 1966 through her sister and it was then that she met with A.C. Bhaktivedanta Swami Srila Prabhupada. She soon became one of the first western adherents of India’s ancient Vaishnava, or devotional, culture and was given the name Yamuna devi dasi. She served as the personal cook for Srila Prabhupada for eight years which laid the foundation for what became her globally-recognized culinary abilities. She contributed to ISKCON in numerous ways, including her famous cookbooks "Lord Krishna's Cuisine: The Art of Indian Vegetarian Cooking" which garnered multiple awards, including the International Association of Culinary Professionals Cookbook of the Year , and being one of the original six devotees who started ISKCON London, and of course as the beautiful voice singing the Govindam prayers at the greeting of the Deities in all ISKCON temples every morning. Yamuna Devi was well known for her own caring and compassionate nature. She had dedicated the last 45 years of her life to Krsna consciousness and was a beloved member and well known figure of the Hare Krishna movement. Yamuna Mataji the beloved daughter of Srila Prabhupada passed away on 20th December 2011 on Saphala Ekadasi in Melbourne Beach, Florida. Kurma has hosted three internationally broadcast television cooking series seen in over 46 countries. His third and latest 26-part TV series "Cooking with Kurma – More Great Vegetarian Dishes" recently screened throughout Australia on SBS and Foxtel. Kurma's light-hearted presentation of healthy, delicious, attractive and innovative cuisine continues to shake off the outdated notion that vegetarian food is dull and lack-lustre. Founder Acarya of International Society, His Divine Grace A.C. Bhaktivedanta Swami Prabhupada attracted many millions of souls towards the transcendental loving devotional service to the Supreme Personality of Godhead Sri Krishna. Making the words of Sri Caitanya Mahaprabhu very true by preaching in the western countries, Srila Prabhupada taught his disciples the art of chanting, cooking, cleaning, preaching, blissful kirtans and he always fed sumptuously all his visitors and disciples with Krishna prasadam. Following in the foot steps of His Divine Grace Srila Prabhupada, his disciple His Holiness Radhanath Swami Maharaj, through his extensive travel is preaching Krishna Consciousness eloquently with his deep insightful presentation of spiritual secrets. 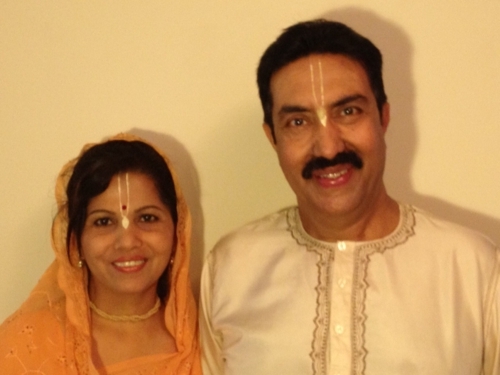 Anand Lila devi dasi and her husband Vraj Vilas das are disciples of HH Radhanath Swami Maharaj and have been practicing Krishna consciousness for the past few years. Many of the recipes they have learned from wherever they have traveled so far. Here we have many varieties of recipes from all over the world to serve all the devotees so that, they can offer nice palatable prasadam to their Lordships at homes, temples or preaching centers and taste the sweet nectar of Krishna prasadam. I was initiated By Radhanath Swami on June 19th 2012 at Towaco temple, New Jersey, USA. 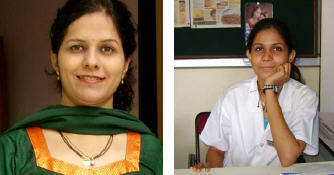 I was a General practitioner of Khar-Bandra area, Mumbai for 26 years. At that time I used to serve in the Chowpatty Radha Gopinath diety kitchen, from where the spark for cooking for Krishna was ignited. Not being initiated I used to cut, chop, wash, clean and bake. I used to experiment new dishes at home first before baking/serving for Radha Gopinath every Sunday for 5 years. Then in 2010, I was forced to come to the USA for green card issues and work in a medical setup. Here, the system was totally different. I got lot of opportunities to cook and bake. I started out with Paduka cake for Nityanand Trayodashi 2010. From then on I started baking theme cakes for various festivals. 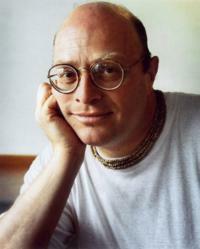 I am just a “Nimmita matram”, a medium used by the Lord to engage me. Whenever I plan a design, it always takes a turnabout at the last minute. I also bake cupcakes, cookies and candies for the Govindas of Central ISKCON New Jersey. Kurma prabhus books, Nitya Navina mataji from New Jersey, Pallika mataji, Anand bhakti mataji, Manjari mataji and Nandrani mataji, Laaj mataji from ISKCON Chowpatty, Mumbai are my source of inspiration. I thank the Lord for giving me this service. 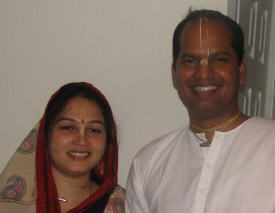 I thank my husband Dr Anil Samtani and children Nisha and Nikhil for helping me to bake and clean up. My desire is to go back to India and serve Radha Gopinath and the Vaishnavas by baking and decorating cakes for His Govindas restaurant at ISKCON Chowpatty temple and to serve at Bhaktivedanta Hospital as a doctor along with my husband. Bhaktivedanta Hospital is a multispecialty hospital, situated at Mira Road, Dist. Thane, India. Department of Dietetics and Applied Nutrition is functional since 1998. The department provides “Satvik Prasad” (Nutritious and Pious Diet) to all hospitalized patients. According to Bhagavad Gita, food cooked has to be offered to The Lord and then honored as Prasadam. In Bhaktivedanta Hospital the food cooked for the patients is also offered to Lord Krishna to nourish the Soul with the mercy of The Lord. Personalized patient diet care is the prime concern of the department. Different kinds of diets are prepared as per the patient’s clinical condition. – Food does not contain onion, garlic, meat, tea and coffee. – Food is prepared as per the seasonal availability of different food items. – We try to provide homely food to the patients. 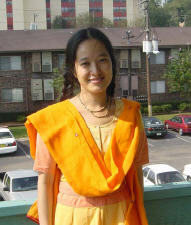 Madhavi devi dasi is a first-year professor of education in America. She met H. H. Radhanatha Maharaja in Sri Mayapur dham and then came to America to take shelter at Maharaja's lotus feet 18 months after their first meeting. Though she had never cooked before she left Taiwan, she not only enjoys cooking for her friends and Maharaja but also making cookies for her students now. Madhavi d.d. also likes to travel; her recipes are from various parts of the world where she has visited. She is grateful to those who taught her how to cook, especially her father and mother, and Judith Mulholland, who introduced her to Krishna Consciousness.